Alcatraz is considered to be one of the most haunted places in America. There are a number of stories circulating that document real ghosts, unexplained phenomenon, and frightening experiences individuals have encountered while visiting what is believed to be one of the scariest places on Earth – Alcatraz. If you are a ghost hunter, you may be interested to know that there are several ghost pictures, and ghost videos taken in this establishment. Here, you will learn many exciting facts about what is considered to be one of the most haunted places in America – Alcatraz, or “Hellcatraz” as deemed by a number of inmates housed in this immense structure. There is a reason why Alcatraz is considered to be one of the most haunted places in America, and it is not just because of the true ghost stories, or the unexplained phenomenon that occur. The history itself is frightening, and the individuals who have played a role in the history of the prison have experienced true and immense fear. Alcatraz was opened in the year of 1934 as a federal prison. 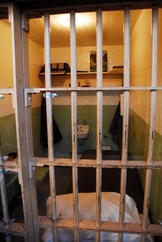 However, this area was used long before opening as a federal prison. Located on the misty island called “La Isla De Los Alcatraces” or “Alcatraz Island”, the official name was issued in the year of 1775. The name actually means “Island of Pelicans”. The water that surrounds the Alcatraz Island is ominous…this is due to the swift and dangerous currents that seem to intensify the closer that it comes to the barren, lifeless land of the island. In the year of 1847, the military of the United States took over the property. This area has also been known as as it is located in an isolated location just off of the San Francisco area. In the year of approximately 1853, the government permitted the construction of a fortress that would assist in military functions. This had a lot to do with the general location, and the ability to engage in military operations without interruption. In 1854, a lighthouse was constructed on the island. This is actually a remarkable structure as it was the first to be erected on the coast that hosts the Pacific Ocean. This would assist boats and ships that needed to pass through the ever-popular Golden Gate Bridge. Just five short years later, this location began to receive prisoners. Over the course of several years, Alcatraz would host many different types of prisoners. These would include those that were court martialed, confederate soldiers, southern sympathizers, and similar individuals. They were forced to sleep in a basement with very little room, no water, no heat, and often attached to heavy weights as their punishment. As time progressed, so did the structure that stood on the gloomy rock among the mists of San Francisco Bay. There came a time when Indians and their leaders were confined due to the fact that they stood up to the white men of their time. Spanish prisoners, military prisoners, and several random prisoners were brought to Alcatraz throughout the years. This was considered to be one of the most punitive prisons in all of the world. Suffering, pain, isolation, and torture were some of the situations that prisoners experienced while staying on the Rock. Naturally, many of these individuals passed away while being held in this dreadful establishment. In the 1920’s, there were several social revamps of Alcatraz. 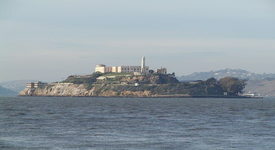 Crime in the United States was on the rise, and it was agreed that Alcatraz should be turned into a prison that individuals would fear going to in an effort to reduce crime. Over the next decade many changes occurred within the structure so to ensure that escaping was not an option. In addition to this, several policies and procedures were put into place, and the best of the best within the penal system on the federal level was hired to work at Alcatraz to ensure that the prisoners could not escape, take advantage of the legal system, and that they were punished according to what was considered to be appropriate at the time. In the early history of prison development, the Quakers were actually the individuals who created the system. Alcatraz was one of the first establishments to put their philosophy and beliefs into place. This meant that all the prisoners held here were issued some basic rights – five to be exact. These were that they had a right to clothing, the privilege of having a shower at least once weekly, a right to food, to see a medical professional when necessary, and a cell that was private. While it sounds appealing to an extent, it must be understood that the prisoners received a bare minimum of the things that they were entitled to – and not always in the way that you and I would believe. The inmates all agreed that this was one of the scariest places on earth. To die in Alcatraz was considered to be the only escape, and several ended up looking forward to their death. Unfortunately, many souls found it difficult to move on…..
Alcatraz or the “Rock” has been deemed as the portal to the spiritual world. There is a lot of negative energy within the walls of this establishment. This is one of the reasons why it is considered to be one of the most haunted places in America. It seems that several of the individuals who were confined here have never been able to break away from the ominous rock – even in death. There are tales of real ghosts, scary places within the structure itself, unexplained phenomenon, and several individuals claim to have taken ghost pictures and ghost videos documenting the unusual events surrounding this prison. 1. The Indians that were housed in the prison at Alcatraz were noted in determining that the island itself was actually a haven for spirits that were “evil”. 2. There is a report of a poltergeist on the island that is often referred to as “The Thing”. It is said that this is an evil spirit with mad glowing eyes that haunts any and every person that steps foot onto the island. 3. Many individuals have heard sounds that reflect that of prisoners yelling for help, in distress, crying, and pleading for release. 4. Chains are often heard rattling within the establishment. 5. Many people have reported smelling something at Alcatraz that they are not quite familiar with, but claim it is a terrible smell. 6. Apparitions have been seen all throughout the history of Alcatraz. These include those of Indians, soldiers, guards, and more. 7. The sound of a female has been heard crying from the walls inside Alcatraz. 8. Cold, almost volatile breezes and winds have been experienced in several locations on the island. 9. Many have claimed that on nights in which the nights are dulled by fog that the lighthouse that once stood on the Alcatraz Island would appear and shine a light, and make sounds. This has actually been noted on several different occasions, by several individuals. 10. Guns, phantom gunshots, and similar noises are said to occur on the island out of no where. Many account these to be residual hauntings, or recordings, of past experiences on the island. Here is a short video about some of the hauntings at one of the most haunted places in America: Alcatraz.